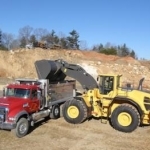 Enviro-Disposal Group is powered by a team of professionals led by twenty-five year industry expert, Richard Rivkin, who has managed more than 3,000 projects involving Transportation & Disposal of Hazardous and Non-Hazardous contaminated soils, dredged sediments and other environmentally regulated materials. Uniquely positioned to provide our clients with the highest degree of technical expertise, and lowest-cost access to numerous Landfills, Recycling Facilities, and Re-use Facilities nationwide. Fast, competent, turnkey service from start to finish. Union and Non-Union transportation via fully permitted tri-axle dump trucks, dump-trailers, roll-off containers, vac-tankers, and drum vans.